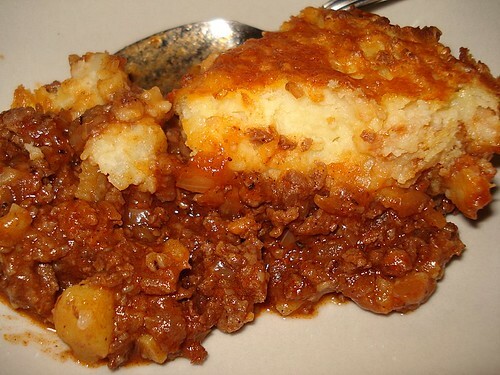 Gordon Ramsay cottage pie - a slice of meat and potatoes heaven, originally uploaded by Camemberu. Found this in Gordon Ramsay's Kitchen Heaven book. 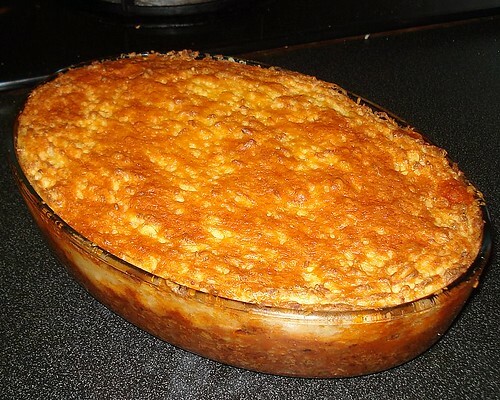 Cottage pie is his all-time favourite comfort food and he has it frequently with wife Tana when they dine out. Here's my variation of the recipe adapted from his. I added cheese to the equation - crispy baked cheese crust is always good, no? And I omitted red wine (since I didn't have any on hand) but you can add that if you like (about 200ml). This recipe purportedly serves four but I think the end result could feed six or eight! Next time for my family, I would halve the meat portion but keep the potatoes (so delicious, and too little this time). 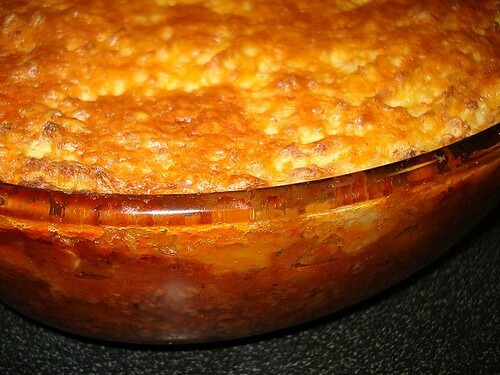 Crusty browned cheese topping, originally uploaded by Camemberu. If you have any fat coming off the mince, drain it (cos you don't want greasy mince). I didn't have any to drain for mine though, I think the high heat seared all the juices in! Put mince in individual or large serving dish. Comfort food that's easy to make!, originally uploaded by Camemberu. Your Shepherd's Pie looks fabulous! I watched Gordon Ramsay teach a newly single father make it for Sunday lunch on the F Word. I jotted down the steps I saw him take, but there was no real recipe. I have all the ingredients as of yesterday and I'm thinking today is the day! Thank you so much for putting this recipe up - it is really helpful :) If mine looks as good as yours, and tastes even close to how good yours looks, then there will be a happy couple tonight! Thanks, Patrick/Karla! Glad this came in useful! Hope all goes well with the dinner!